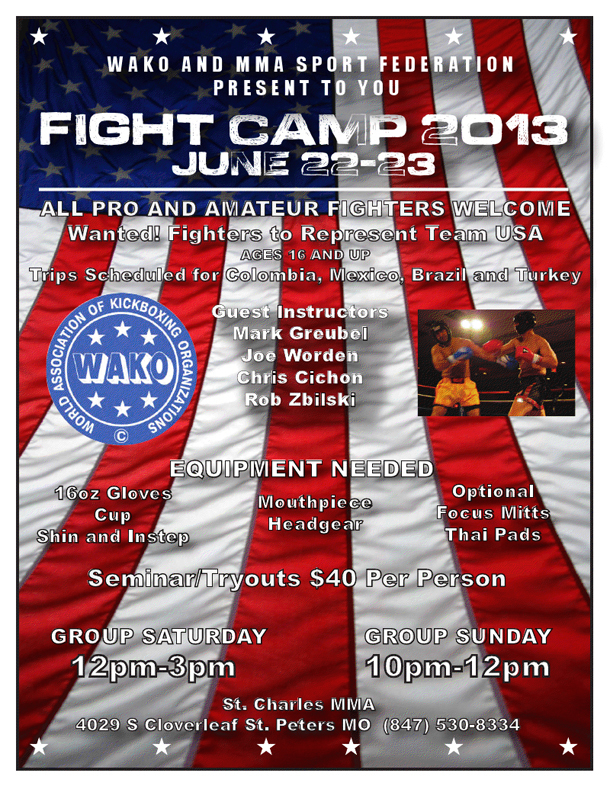 On June 22nd and 23rd in St Peters, Missouri WAKO USA will be hosting a training camp and fighter tryouts for Team USA Kickboxing and MMA events in Columbia, Turkey, Brazil, and Mexico. The event is open to all amateur and professional kickboxing and MMA fighters and the training sessions will be lead by Team USA coaches: Mark Greubel, Joe Worden, Chris Cichon, and Rob Zbilski. The cost to participate is $40 and all fighters should bring 16oz sparring gloves, shin pads, headgear, mouthpiece, cup, as well as optional focus mitts and thai pads. This entry was posted in Team USA, Training Camp, Tryouts. Bookmark the permalink.